NWG has just returned from the Oval. Frankly, she's in a state of shock. England just won. By a mile. With a day to spare. And the best part about it, was that she was there. For every day. For every over. For every run. For every wicket. Cricket is simply the best game in the whole entire world. O per-lease Nightmare. It's just a Test series. You haven't achieved anything really, think about it. In reality, it's just an opportunity for the English to get pissed. Plus, it wasn't like it was a 5-0 thrashing was it. Now when did that last happen and who to? I am pleased for Levi Strauss though. 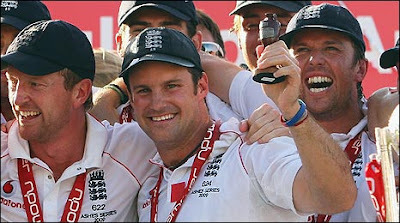 He's a good guy and I believe should have been given the captaincy before Pietersen. But why are they holding the urn aloft when it is not an official trophy? In fact, the urn which did not exist for some time whilst Eng and Aus first started playing Tests, has never been awarded to either nation. Don't listen to the nay-sayers and bad losers. You can recant the story to all the little NWGs in years to come. Thanks Rob. NWG appreciates your comments. Stani, on the other hand, is clearly just very grumpy. If he had been at the ground yesterday he could have got rid of that bad mood. Stani - get over it. England rule. Congratulations NWG and you rfellow England supporters ... you deserved the win , having been dominant in 3 of the 5 matches. Well done to all the England team, but look out next time - we will wanting a whitewash! That's embarrassing, apparently I can type. oh god! that should be "can't type" - I will stop now and go lie down. This is what losing the Ashes does to one!! Sid- NWG appreciates the sentiment. Yes, the next Ashes in Australia will be a different story, but we're allowed to hang on to this summer for a bit anyway. Referring to me Robert? Don't like using people's names? How obnoxious. I don't support Australia so I can't be a bad loser. England rule? Rule what NMG?...and why did you avoid the questions in my first comment? Stani - who cares about 5-0? Very happy for the team. Enough of them stood up at the right moments. Broad and Swann ripping through the batting was one of the best bits of cricket I have seen. Absolutely, NWG - think about the next series when it comes about. Enjoy your moment. Sid that is precisely why NWG is enjoying it now.